The BMW X2 (shown) is shorter and lower than the X1. It has a stretched, coupe-style roofline and slim window graphics. 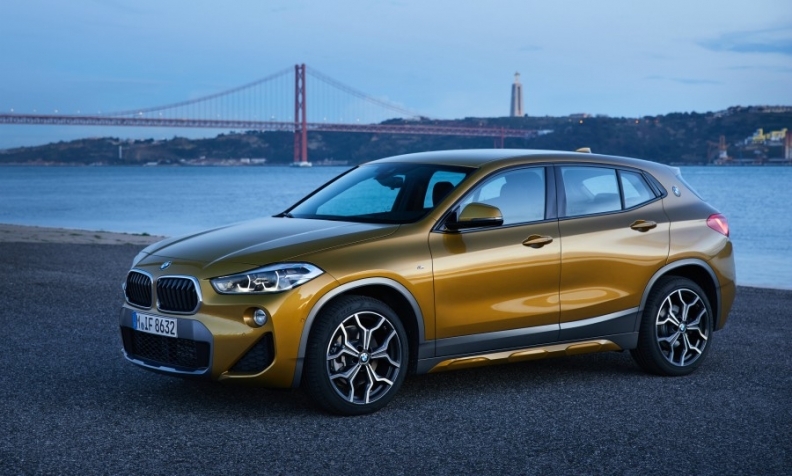 BMW's all-new X2 targets young and young-at-heart customers with active lifestyles who are keen to see their personal character reflected on the road through an emotionally appealing car. The X2 is a sporty variant of the X1 compact SUV and belongs to what BMW calls its Sports Activity Coupe range, along with the X3-based X4 and X5-based X6. BMW says the crossovers have a stand-alone character that combines the robustness of its X-badged SUVs with the athletic look of a coupe. The X2's designers had the task of fusing a coupe's typical sleek shape with the bulkier size of an SUV. "It was important to make these apparently conflicting aspects and the X2's individual character something you experience from every angle and at first glance," said Thomas Sycha, BMW's design boss for compact vehicles. To enhance its sporty stance, the X2 has an additional BMW badge on the C-pillars, a detail reminiscent of classic BMW coupes such as the 2000 CS and 3.0 CSL. At 4360mm long, 1824mm wide and 1526mm tall, the X2 is 79mm shorter, 3mm wider and 64mm lower than the X1. The two vehicles share the same platform and a 2670mm wheelbase. On average, the X2 in Europe will cost about 1,500 euros more than a comparably equipped X1. Last year, the X1 became BMW's best-selling SUV with more than 296,000 sold globally, the company said. The X2 will remain a niche offering in comparison with the more mainstream X1, said IHS Markit analyst Tim Urquhart. "While it will no doubt be something of a stylish brand builder, the market for the coupe-SUV body style remains relatively restricted," he said. BMW will sell about 62,000 X2s globally this year and 84,000 next year, according to IHS estimates. The forecasting firm expects BMW to sell 251,000 X1s this year and 230,000 in 2019. Engines: The X2 has a wide range of 3- and 4-cylinder gasoline and diesel engines, from a 140-hp gasoline unit with a manual gearbox and front-wheel-drive to a 231-hp diesel with 8-speed dual-clutch transmission and all-wheel drive. Connectivity: The SUV has BMW's updated Connected Drive with Apple CarPlay support and an array of driver assistance systems. Safety technology: The X2’s Traffic Jam Assistant takes over proximity control and lane-keeping tasks from the driver at speeds up to 60 kph (37 mph). An optional parking assistant automatically identifies suitable parking spaces and, if desired, takes over steering duties for the parking maneuver. What's good: The color head-up display offers a range of display readouts that reduce driver distraction.